A couple of weeks ago I started thinking about Valentine’s day and, since I like equations that have interesting plots so much, I wondered if I could find one that had a heart-shaped graph. A quick google search came up Wolfram Research’s Heart Surface page. The main page described a couple of heart shaped algebraic surfaces which looked nice but there were a few more on the Mathematica notebook that the page linked to. This notebook was rather old and included plots from old versions of Mathematica so on the train ride home I wrapped these equations in some Manipulate functions and sent the resulting demo to Wolfram. The result was published today on the Wolfram Demonstrations site. Essentially all this demo does is use Mathematica’s ContourPlot3D function to plot the curves formed from the following equations and allow you to play with the results a bit. Each equation is named after the person who first wrote it down (to my knowledge at least). It’s a simple demo but I hope you like it. Thank you very indeed for these lovely articles you have put on the internet. 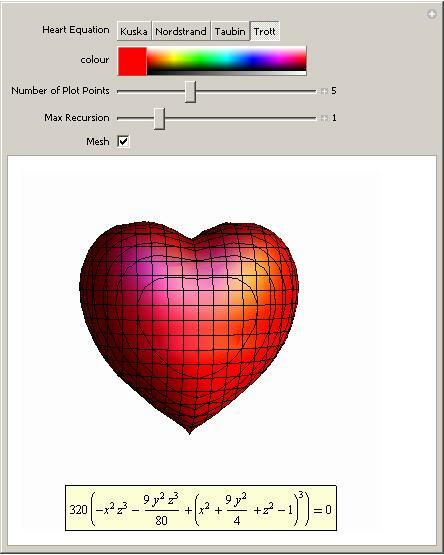 I was looking for a way to make a HEART shape with MATLAB, and I searched google and I came across your website. I would highly and greatly appreciate it if you could do us a big favour and send me the full MATLAB code for designing this lovely picture. Thank you in advance and I am looking forward to hearing from you. How can i use this formula in matlab ? See http://www.walkingrandomly.com/?p=455 for MATLAB code. The Taubin and Trott equations are identical — so why have them both? You are absolutely right and I am rather embarrassed at not having noticed before! I guess I should update the demo at some point.